The tub is surrounded by curtains hung on a framework of copper pipes suspended from the ceiling by chains. One of my favorite methods of dealing with pain, with lack of inspiration or with almost any other problem is a hot bath. The main ingredient for a truly inspiring bath is a cast iron claw-foot bathtub, which holds heat as no modern plastic tub can do. The one in my basement, though, is somewhat shorter than I am, so a relaxing soak requires some bending. As I sink into the hot water, I often dream of the six foot long tub I discovered in Scotland. 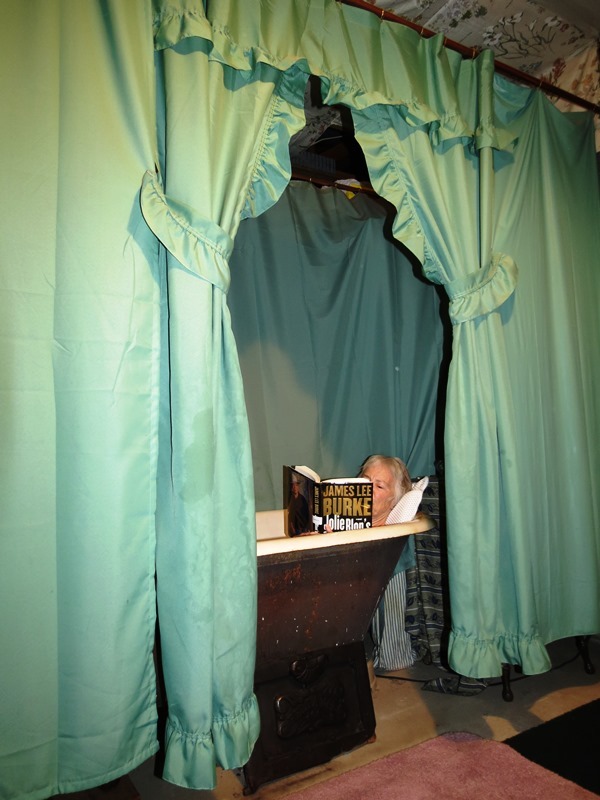 Even as short as it is, though, the tub fulfills its promise as a Writing Aid. Turning the hot water on full, I pour in an herbal mixture that includes eucalyptus, peppermint, wintergreen, clove and juniper oils to soothe muscle aches. Then I’m ready for the ritual. First one foot– if the water is too hot, I may have to modify it, and I’ve scalded my poor right foot several times. If the water is perfect, I step in, sit, cross my legs to fit in the tub, and lie back with a sigh. Sometimes I just close my eyes and visualize how the hot water is soothing muscles and sinuses. Secure in the knowledge that no one will disturb me, I can let my mind free of everything that has concerned me for days or weeks. I may immerse myself completely in the steaming, echoing water, hearing the cast iron ping and bong as it absorbs heat. I may try to remember the words to the Janis Joplin song “Mercedes Benz,” or think of a poem I memorized in high school. When I sit up, spluttering suds, I feel renewed. When I’m conducting a writing retreat, my first task in the hot bath is to think of the writer I’ve been working with during the day. What have I failed to mention? Have I been encouraging enough? Are there other resources to suggest, or other handouts I could provide? Almost always, I capture a thought that I missed while I was intently reading the writer’s work, or talking about it, so I’ve made a hot bath part of every retreat so I don’t miss that vital notion. I apply the same logic to my own work when revising: a hot bath often reveals an answer that eluded me during days of walking, thinking, and staring at the computer screen. Sometimes I take a book to read, placing it on the table behind my head as I scrub or while I meditate. I love to read until the water cools enough to remind me it’s time to get out. But I have to exercise care not to drop the book– especially if it’s from the library. But most often, after a period of reflection or reading, I write. 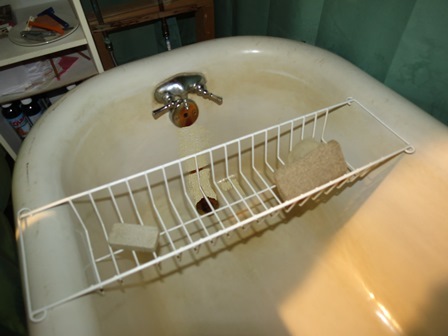 On a shelf at the head of the tub is a stack of small squares of recycled paper and a pencil. It’s easy to grab one of the little squares, scribble a thought, and toss it on the rug beside the tub. Thinking is writing, I’ve often said, and lying back in a tub at the perfect temperature is conducive to thinking. 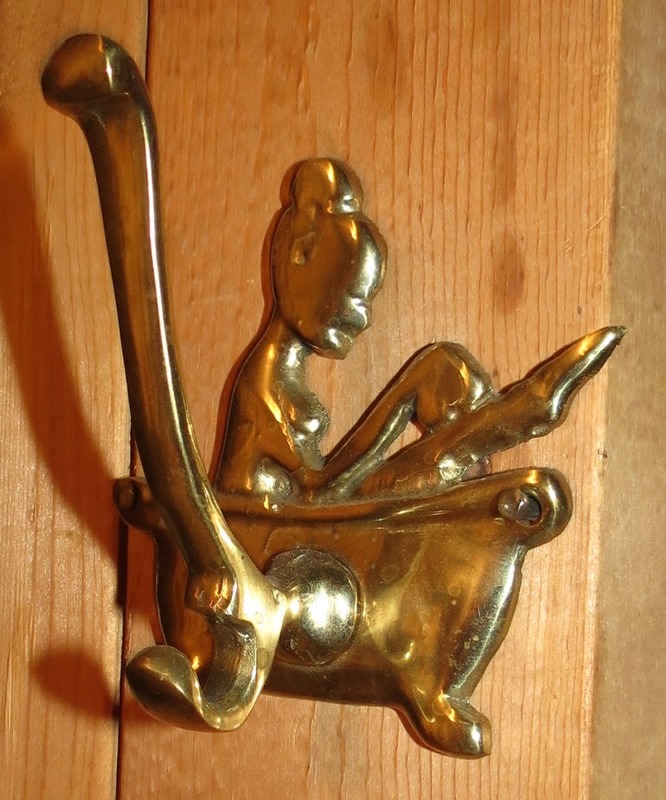 A brass hook to hold my bathrobe. One idea often sparks another, so that at the end of a truly great bath, the rug is littered with a half-dozen little squares of paper. After I’m dry, I gather them, stacking them by topic, and carry them to my computer desk, where I’ll find them the next day– and get a great start on the day’s writing.